The screenshot below shows the structures for the Shadow Knight, which are currently being used for all 3 leaders until those sets have been completed. The fortification towers have a gargoyle at the top, which opens its wings during an attack. The portal stronghold continuously animates while it is active. Both have frames for being partially destroyed too. The bone tower is the basic tier 1 combat tower. The guillotine is the tier 2 tower that generates prestige when it kills enemy zealots. I added a dark treant to show the scale since that is the largest troop. As for my progress, I made so many changes this past month that I don’t know where to begin. The game is in great shape. I just sent out a test build for the alpha version to a few friends. I want to start getting early feedback so I know if the game has any major issues. I also want to get an idea of what direction I should take the game, based on what aspects are the most fun. I tweaked a bunch of stuff. The user interface is further along. Multiplayer had a few issues fixed. I moved all structures and magic sources to the final design layout. That allowed me to add the new artwork. I also made some changes to the design for the guardian. For now, the guardian upgrade can be purchased after the fortress reaches max level. It costs both power and a lot of prestige. 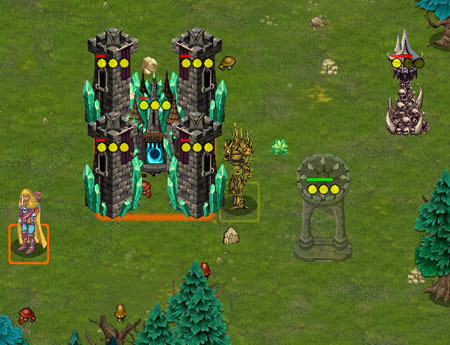 Once upgraded, fortification towers and banner zealots for that fortress gain an additional AoE ability. Those abilities refresh using the same timer that automatically levels those structures. That also means the refresh timers can be sped up by friendly zealots that reach the fortress. They can be halted too by enemy banner zealots. In addition, a guardian buff becomes available that costs power and prestige. It adds a buff that lasts for 30 seconds. While active, those guardian attacks are greatly amplified. Enemies can be devastated with careful timing of that buff. Leaders can also use their zealot sacrifice ability to directly trigger the banner AoE in the middle of a group of enemies. I’m going to update the web site this week. I hope to finally add a page that describes the units and other gameplay features. I’m completing the final alpha milestone in a few weeks. Then I will create a video that shows the main game features. I’ll also use the core part of that video for my Kickstarter campaign, which I plan to start on April 16th. More on that soon… thanks for reading! The screenshot below shows different angles of the Stalker’s Treant troop. That is the siege unit, which has a special ability called Murder of Crows. When activated, the crows sitting in its twisted branches carry sharp barbs to friendly troops to provide a damage shield. I also included each player color so you can see all of the variations. As a reminder, gold is used for your troops, blue is used for allies, and red is used for enemies. I also added an avatar image to the game interface. Right now it is a rough draft, but it already looks cool. The current version shows the head and shoulders of a hooded figure with a hidden face. Spikes stick out of its shoulders. I display the current number of enemy banner zealots that are attacking your fortresses using red text under the avatar. I plan to make many improvements to the design, including animating the avatar. I also want to add voice overs to give situation awareness. In addition to that interface change, I made several other tweaks. I added a divine bar on the right to mirror the avatar bar on the left. The avatar bar is used to activate the avatar abilities mentioned in the previous blog update. The new divine bar is focused around divine abilities (zealots and guardian). That includes the option to select a banner zealot destination, teleport leader to banner zealot, and two more powerful abilities. The guardian of the fortress can be summoned to cast a powerful breath weapon at a chosen location. I still need to implement that breath weapon, but the general idea is that it will cause a lot of damage and include some special effects. It will probably have a longer recast that is affected by the fortress timer (influenced by banner connections). The other ability buffs the banner zealot and will also be tied to the same timer and recast mechanism. I’m planning to modify the current banner AoE to only happen when this buff exists. Also, I will probably only trigger the AoE when the leader uses its sacrifice ability on a connected zealot while the buff is active. Both of those abilities will most likely cost prestige in addition to power. I mentioned previously that all 4 avatar abilities also cost prestige. At the time I just had a few of those abilities implemented. I now have all avatar abilities implemented with some kind of useful effect. Most will be modified further, especially the ones that are generic. I just want something in place so I can test them out. It will also help when I play my first Internet game with a friend in about 3 weeks. Besides that stuff, I created the design layout for the fortress and tower animations. I have the layout done for the crystal animation too. The structures are taller than even the siege units to they create some scale to the game. Fortresses will show a pulse effect that matches the crystal pulse before the fortress is summoned over it. The fortification towers will have a simple attack animation. Both have a frame for when they are destroyed. The detached towers will have a more intricate attack. The initial version of the fortresses for all 3 leaders have been created already. It will be great to have the completed artwork for them in game. I have been using the placeholder art for a few years now. So I’m continuing to add new artwork to the game. I will be sure to always include a screenshot in each new blog post, at least for a while. I’m also adding more details such as shadows to trees. Plus I’m tweaking the multiplayer. All of these efforts will help prepare the game for outside testing as well as my Kickstarter (early April). Thanks for your time! I’ve learned that sometimes you let the gameplay unfold as part of the process. One simple design decision can eventually lead to a new gameplay idea that becomes an important feature of the game. I trusted that process when I was working on the multiplayer code a few months ago. I had to sync the zealots between server and client with some new code since the requirements were different from my normal entities. I don’t like sending any data to clients that they can’t see in order to prevent cheating. However, I decided to break that rule initially in order to simplify the design. I didn’t want to waste time implementing a more complicated and time consuming design when the gameplay could change, negating the need for it. As mentioned in my previous blog post, I was able to test the zealot code between server and client by making another change. I made all zealots visible to make sure they were sync’d correctly. I was able to do that since I send all zealot data (using an efficient design). I then decided to keep that change because it made the game feel more alive. Recently, I began to streamline the user interface. It made sense to help players determine when those zealots were attacking their fortresses. After all, they could see them and the code has that information. That led to some additional code to track self, ally, and enemy banners for each fortress. So you could click on a fortress and see what banners are attempting to reach it. Furthermore, I total those stats for each player so you can get a representation of current threat level. For example, you might see that 5 enemy fortresses are targeting your own fortresses. Then you could determine where the attack is heading and identify those zealots on screen. That gives you some time to manage your own fortresses, possibly reconfiguring your banners while adding towers and troops. But it would also be cool to convey that information in a more creative way than just displaying numbers. That’s what led me to a new gameplay concept that I have started to design. I will add a game avatar that is part of the user interface. For instance, it could be a skull that changes in appearance depending on the current game state. It could talk to you - “the enemy marches to our gates!” I would have a lot of “flavor” voice overs for various game events, such as effective use of leader abilities, allies coming to your aid, etc. I can also change the music tempo according to what is happening in the game. I think that will add a fun element while also being an effective way to convey situational awareness to players. It is inspired by games I used to play such as Fantasy Empires. It is also a good example of how a simple design decision for multiplayer code can lead to a new feature involving a game avatar. And I’m sure I will continue to evolve that feature as well. Besides that stuff, I made a lot of other progress, which I will quickly summarize. The damage for leader abilities is more consistent, which allowed me to make them more potent. The computer AI is now more effective when attacking. The leaders of computer players will flee more reliably before dying. They can defend fortresses too instead of just being offensive with their abilities. Gaining ownership of an unprotected portal is also more fair due to processing all banners before deciding the “winner”. Previously the first one to process could gain ownership with less banners. The user interface was revamped so last selected owned fortress is always displayed. That makes it very easy to summon troops to a rally point while remaining focused on the current battle. Fortresses can be “tabbed” to select next. Leader abilities are always shown too. The selected entities will determine the center interface bar, such as moving troops. I will move some information to interface icons (like troop count) instead of text. Plus many more enhancements. You are currently browsing the archives for the Pursuit of Power 2 category.